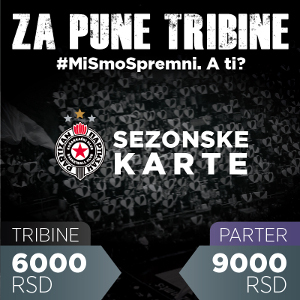 On Tuesday, December 11, Partizan NIS are playing the ninth round of the 7DAYS EuroCup. The black and whites are playing an away game against the French ASVEL, and the game is scheduled for 8:30 PM. The two teams met in the fourth round of the EuroCup in Belgrade, when ASVEL won with the score 78:89. "ASVEL are a great team. They beat us in Belgrade with smart play, and now we can do the same. We have to play one game, and we have to know that there is only one result, and at the same time we have to play our game. Having only one result should't be a problem, but a goal. This is a win or go home situation", Trinchieri pointed out. "We have already played with ASVEL once, and we know that they play physical basketball. We have to try to beat them by playing smart basketball. We are a young team, and in every game we aim to win. Those are our expectations before this game, as well."